Home Blog Creamistry: “Ahhh-mazing” Made-to-Order Liquid Nitrogen Ice Cream! “I scream, you scream, we all scream, for ice cream!” And this is certainly the case when it comes to Creamistry’s fresh customizable creations. Creamistry is taking the nation by storm as one of the fastest growing liquid nitrogen ice cream franchises available today. Step 1: Choose Your Size and Base. So what does this mean? Well, you get to pick the size of your cup: regular or large? Or perhaps you want a shake or an ice cream sandwich? Once you’ve got that down, then comes the base. 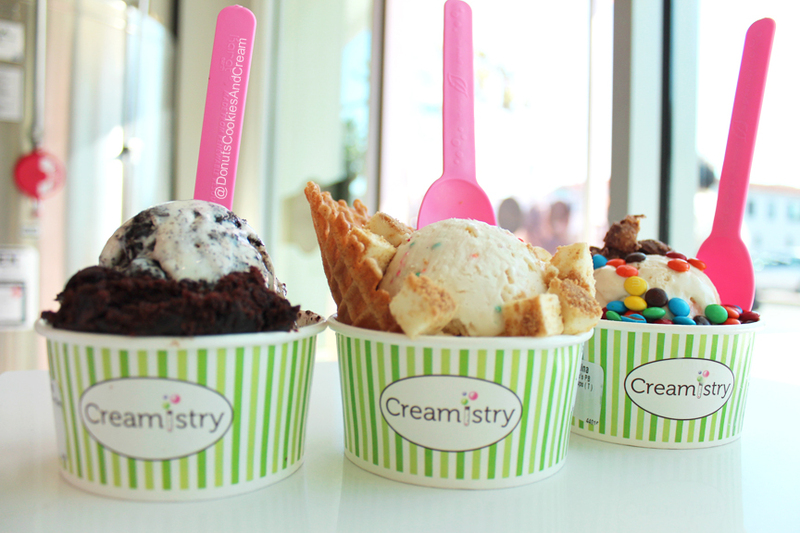 Your base options include Creamistry’s Premium base, a rich and creamy base. An Organic base. A Sorbet base of various flavors: Blood Orange, Green Apple, Mango, Pineapple or Pink Grapefruit. And finally, a Vegan option for those with dietary restrictions. Creamistry caters to dietary needs without compromising flavor or quality so no one is left behind! Step 2: Choose Your Flavor. And there are so many flavor options. The categories alone include Cereals, Cookies & Cakes, Nutty, The Classics (such as caramel, chocolate, etc), Coffee & Teas, and Fruity flavors. This is truly where the customization part comes in! Toppings & Upgrades include a multitude of options that range from Candies; Cereals, Cookies & Cakes; Fruits, Nuts, & Sauces. 60+ flavor and topping options in all. All of them are so very tempting but this is where you find the perfect touch to top off your creation. Now is the final step… which isn’t a step for you but when the Creamistry magic happens. To witness the specially trained Creamologist making your fresh made-to-order creation if front of you in a matter of minutes is nothing short of amazing and entertaining. So how does this magic happen? 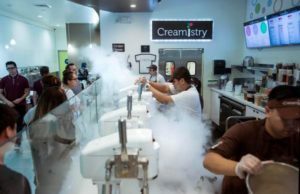 Creamistry shares that when their Creamologists inject liquid nitrogen into the mixing bowl, combining it with the ice cream mix, the liquid nitrogen quickly evaporates into a big cloud of smoke. Within seconds, the liquid nitrogen has vanished and you’re left with the freshest, creamiest, most indulgent ice cream. And it’s perfectly safe to consume. And just like that… you can have your own customized freshly made-to-order ice cream. Yum! So now for the scoop on Creamistry’s franchise opportunities. Creamistry’s recipe for success includes finding owners and operators that are as passionate about ice cream as they are, and have some prior food service experience. If that is you and you have a minimum liquidity of $300K and net worth of $500K, then this is the perfect opportunity for you to own an amazing business that is rapidly spreading across the U.S. And putting smiles on its customers’ faces! If you are interested in learning more about the Creamistry franchise concept, contact us today at heretohelp@franchiseba.com!